The French Open 2012 has been an exciting set of tennis matches. After the rest of the championship match is cancelled due to rain, it is resumed again on June 11, 2012, 4:00 a.m. PST. The conditions are overcast but dry. Novak Hjokovic is leading in the fourth set at 2-1, up a break. Trailing in sets, 1-2. Good, hard rallies between him and Rafael Nadal occur to feel each other out until Rafael hits a winner to break Novak and tie it at 2. Early on, it’s Novak making the errors, and he certainly can’t afford that here in the fourth set. Rafael takes his serve to lead at 3-2. It’s now the sixth game, and Novak tries to change the pace by coming to the net. It works, and then he takes the game on a forehand that was called out, then overturned, making it 3-3. Rafael takes his serve to make it 4-3, and on serve. Then the rain starts up again. With an ace, Novak ties it again at 4-4. Rafael takes his serve easily at love to lead at 5-4. The rain picks up. Officials check the court and decide that play will continue. Novak looks a little more composed as he wins his serve to bring it to 5-5. Then, hallelujah, the sun comes out! Rafael, despite a questionable line call, takes his serve to lead at 6-5. Crunch time. It is now or never for Novak. He now serves at 30-40, championship point. Believe it or not, it’s a double fault. 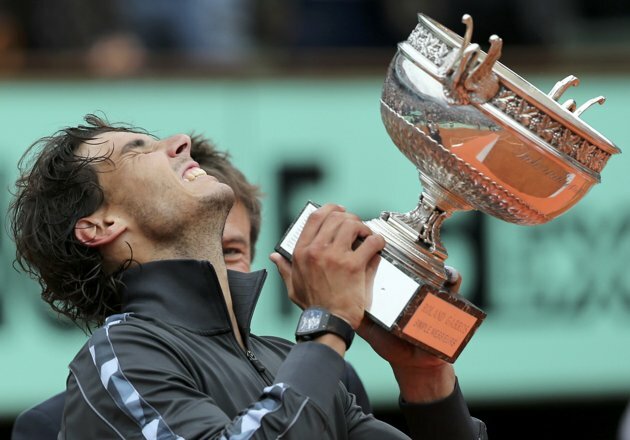 Rafael Nadal wins the French Open, the seventh French he has won. Incredible!